Botanical name of Guduchi is Tinospora cordifolia. Family Name of Guduchi is Menispermaceae. Guduchi is one of the most rejuvenating herbs. It works all the tissues elements of the body. Guduchi means which protect the body from disease. So it is called Amrita. It strengthens the immune system of the body. It grows thoroughly in India. It is considered as a Hindu medicine. It is a deciduous woody climber. The aqueous extract and alcoholic extract helps in reduction of blood sugar level due to its bitter principles. Leaves are rich in calcium and phosphate. The fresh stem is more efficacious than the dry stem. It is collected during the rainy season. The raw drugs are used for the preparation of many of the Ayurvedic medicines. The drug commonly used in rheumatism, urinary disease, dyspepsia, general debility, fever etc. This plant is also used for the ornamental purpose. This drug has been used in traditional Indian medicine system since ancient time. In Vedas and Puranas Guduchi mentioned pittaghni, bhishakpriya. In samhitas like Sushruta Samhita, he mentioned Guduchi leaves as therapeutic in mahajwara and jwara (various types of fever). Nighantu (Ayurvedic texts) mentioned its efficiency in jaundice, Vatarakta etc. Bhavamishra considered it as a time astringent, diuretic and potent aphrodisiac. 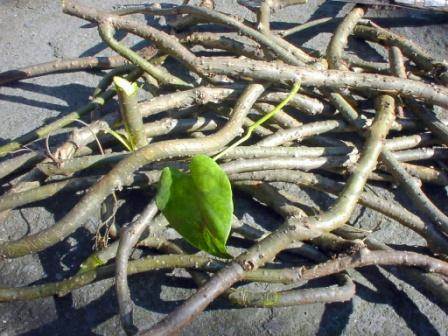 Dhanvanthari Nighantu considered that it is useful in bleeding piles & ulcers. European physicians in India used it as febrifuge & diuretic. Guduchi is also known by Amruta, Shyama, Nagakumarka, Amruta lata, Vamsa, Amruta valli, Vatsadini, Bhishakpriya, Vishalya, Chakralakshika, Chandrahasa, Chandraprasa, Chhinna, Chhinnaruha, Chhinnodbhava, Devanirmita, Ghora, Goraksha, Jeevanti, Kundalini, Madhuparni, Rasayani, Sangrahini, Soma etc. Gana (Acc. to Charaka)- Vayasthapana, Daha prashamana, Trishna nigraha, Stanya shodhana,Triptighna. Varga (Acc. to Sushruta)- Guduchadi, Patoaladi, Aragwadhadi, Kakolayadi, Vallipanchamula. Acc. to Bhavaprakasha- Guduchyadi gana. A glucoside, alkaloidal constituents, their crystalline substances, two bitter principles and a neutral fatty alcohol is found in stem of Guduchi. There is also presence of the bitter principles Columbian, chasmanthin and palmarin in the drug. Some other texts mentioned 3 bitter compounds namely tinosporin, tinosporic acid and tinosporal. The leaves are rich in calcium and phosphate. Different constituent reported include a glucoside, alkaloids, bitter principles, crystalline components etc. The glycoside- giloin, and non glucoside- gilenin and gilosterol have been found. The bitter principle has been identified as columbin, chasmanthin and palmarin. The alkaloid tinosporin, tinosporic acid and tinosporal have been identified in leaves, which are rich in protein, calcium and phosphorus. Protoberberine alkaloids are found as trace components in many plants. Alkaloids belongs to beberin, palmatin, tembutain, mangoflorin, choline & tinosporin. Other components are sterol, aphenolic, lignin, tinospolidin, cordyol. Rasayana, vayasthapana, dhatukrit, jvaraghna, dahaprashamana, kushthagna, vedanasthapana, kaphaghna, vrishya, chakshushya, medhya, balya, keshya, kesharopana, bhramahara, hridhya, raktashodhana, raktavardhana, trishnanigraha, chhardi nigraha, bhootaghna, deepana, pachana, sangrahi, anulomana, pittasaraka, krimighna, mutra janana, vishaghna. Guduchyadi churna, Guduchyadi kwatha, Guduchi leha, Guduchi taila, Guduchi satva, Amrutarishta, Guduchyadi ghrita, Guduchyadi rasa kriya, Guduchi hima. The piece of thick ariel roots of the same plant is always present in commercial samples. The surface of these pieces is smooth and light grey in colour. Stems of T. malabarica and crispa are the common adulterants. Some commercial samples of Guduchi contain exclusively of T. malabarica. There is a minor difference in the external morphology, the surface in the latter case, however, is slightly hairy. It is considered to be the source of kandodabhava Guduchi in ayurveda pharmacopoeia.